Corsair has updated its range of One Pro PCs, offering three new configurations that include a 480GB M.2 NVMe SSD and, in the top two models, an Nvidia GeForce GTX 1080 Ti GPU. Although well received at launch - our own review described it as 'the best mini-ITX PC we've ever reviewed' - the absence of an M.2 SSD in so pricey a PC proved irksome, especially as the motherboard used actually had a slot for one. Corsair now appears to have taken such feedback onboard, refreshing the range with a trio of configurations that all have a 480GB M.2 NVMe SSD fitted as standard. The exact model and specifications of the SSD are not given, however, with Corsair instead simply promising 'up to 5x the speeds possible via a single SATA SSD'. The new models are also equipped with a single 2TB HDD. You can see all the new model configurations above. UK pricing for the three new PCs in order of least expensive to most sits at £2,199.99, £2,599.99, and £2,719.99 (inc. VAT). Some specs remain the same as previous, but the range has benefited from a subtle but meaningful improvement in some key aspects. Models sporting GeForce GTX 1080 Ti graphics cards are now more easily available. 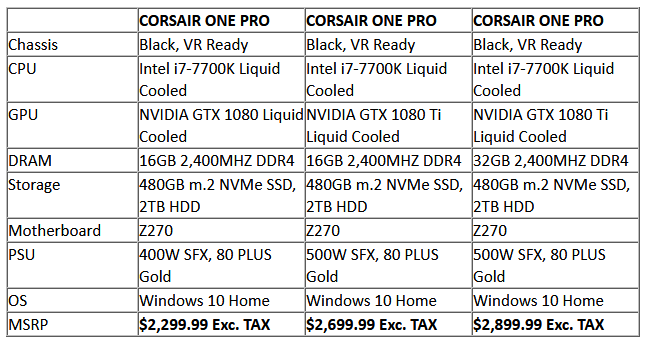 Last time, the model packing this card was a Corsair.com exclusive; this time the top spec model is again such an exclusive but the second model down, with the same GPU, isn't. Previously, the highest capacity RAM you could configure was 16GB. Above you can see that you can now buy a Corsair One Pro system with 32GB 2,400MHz Venegance LPX DDR4 installed. Storage is more evenly upgraded throughout the range, as detailed above; earlier in the year, however, there was a mish-mash of options limited to SATA SSD and HDD combinations. The compact system retains the unique dual-loop convection cooling, with the GeForce GTX 1080 Ti in the Corsair One Pro boosting clock speeds 'to 100MHz faster than an equivalent air-cooled GPU, all while running at temperatures close to 30°C cooler'. GTX 1080 Ti equipped models get an upgraded 500W PSU as well. Corsair says these updated PC systems are immediately available in North America, Europe, and Australia from authorised dealers and direct from the Corsair webstore. More information is available on the official product page.